In recent years Marvel has released many reprint collections in trade paperback form containing their classic comics from the 1960s and 1970s. It can be a bit confusing which ones to buy as Marvel has three different lines of books which aim to reprint the same material but in different formats. Those lines are Essential, Omnibus and Marvel Masterworks. The Essential line is the most economical as the softcover volumes are printed in black and white on newsprint quality paper. The book dimensions are virtually the same as the standard sized comic. The artwork comes out quite clearly in black and white and is perfectly readable. These trades are very convenient and lightweight, offering over 500 pages of content per volume. On the flipside, they are a bit flimsy and there have been reports of the occasional book falling apart due to their less-than-sturdy construction. In 2007, Marvel began releasing Omnibus editions. These are massive hardcovers ranged from 700 to over 1,000 pages long. The dimensions of the reprinted issues are slightly larger than the standard comic book, and they feature artwork that’s been restored with remastered coloring to match the original comics as closely as possible. This makes the Omnibus books the most expensive, but you certainly get what you pay for. The main issue you may have is that these books are so big and heavy that you will need to put them on a table to read them. They aren’t books you can hold in your hands comfortably. As far as quality of the reprints themselves, you won’t find anything that looks better or more authentic than those contained in the Omnibus. Marvel Masterworks were a series of hardcover reprints originally released in 1987. The original Masterworks are relatively hard to find and expensive, but luckily Marvel began re-releasing them in early 2009 in softcover trade paperback form. They have standard comic book sized dimensions and are printed in color. They offer the least content per volume, offering around 250 pages or more, but are a good compromise between the Essential and Omnibus editions. Which you should purchase depends on what you’re looking for and what your budget will allow. In the Omnibus editions, all the issues appear inside with full page covers, but with few extras. For first time readers that are curious I think the new Marvel Masterworks TPBs are the best option, but if you don’t mind black and white you can get almost twice the content per volume at a lower price with the Essential books. It should be noted that the Essential line covers the largest amount of classic comics. For later issues published in the 1970s, the Essential books are your only option at least until the other books catch up. Here’s a rundown of these volumes as relates to my favorite hero, your friendly neighborhood Spider-Man. Created by writer Stan Lee and artist Steve Ditko, Spider-Man made his first appearance in Amazing Fantasy #15 in 1962. Months later that same year he would appear in his own monthly title called the Amazing Spider-Man. Up to now there are eight volumes of Essential Spider-Man which reprint Amazing Spider-Man. Whether you choose to buy either the Essential, Omnibus or Marvel Masterworks reprint collections, you’ll be getting Amazing Fantasy #15 and at least Amazing Spider-Man #1-10. The stories in these issues encompass a lot of what fans love about Spider-Man. Amazing Fantasy #15 details his origin story. It’s a simple story that gets straight to the point and in my opinion is an almost perfect origin story. It introduced the social (or lack thereof) life of Peter Parker as well as his Aunt May. It also showed how he got his powers and costume, and the event that motivated him to become a superhero. Amazing Spider-Man shows his exploits as he encounters many villains who would become mainstays of his rogues’ gallery like Doctor Octopus, Lizard, Sandman, Vulture, Electro and Chameleon. Early on Spidey tackles other popular Marvel characters such as the Fantastic Four and Doctor Doom. J. Jonah Jameson also makes his first appearance in Amazing Spider-Man #1 as the Daily Bugle’s ranting editor. Later issues would introduce his secretary Betty Brant whom would be Peter’s first girlfriend. This is what you can expect from Marvel Masterworks: Amazing Spider-Man Vol. 1. In Essential Spider-Man Vol. 1 you’ll get ten more issues of Amazing Spider-Man and an annual. Other Marvel heroes such as Daredevil and Hulk make appearances, as well as new villains Mysterio, Green Goblin, Kraven and Scorpion. The annual features the formation of the Sinister Six which is a great action-packed story. Throughout all this Peter has to deal with his fair share of personal issues at school and at work but I’ll leave that for the new reader to discover. Amazing Spider-Man Omnibus Vol. 1 collects Steve Ditko’s entire run up to Amazing Spider-Man #38 before his departure from the title. Compared to the first twenty issues of Amazing Spider-Man, the next ten or so feature some rather forgettable villains although some of the A-list villains do return. The first “appearance” of Peter’s future wife, Mary Jane Watson, also occurs but with her face obscured. You never actually see her face in this volume. Peter graduates from high school and goes to university where he meets Harry Osborn and Gwen Stacy. Harry’s dad Norman is also introduced. These characters would become very significant in the overall Spider-Man mythos. A real highlight are issues #31-33 comprising the Master Planner story arc which is considered by many fans to be one of the best Spider-Man stories ever. Marvel Masterworks: Amazing Spider-Man Vol. 1 contains Amazing Fantasy #15 and Amazing Spider-Man #1-10 plus an introduction by Stan Lee from the original 1987 release. Volume 2 will be released in 2009. Essential Spider-Man Vol. 1 contains Amazing Fantasy #15, Amazing Spider-Man #1-20 and Amazing Spider-Man Annual #1. There are eight volumes in total with volume 9 being released in late 2009. Note: If you intend to buy volumes 3 and 4 read the next paragraph as there are some discrepancies between different printings. The more recent printings of volumes 3 and 4 are actually called second editions if you read the fine print inside the books. Older printings of volume 3 and 4 collect Amazing Spider-Man #44-68 and Amazing Spider-Man #69-89 and Annuals #4-5 respectively. The second edition printings of volume 3 and 4 collect Amazing Spider-Man #44-65 and Annual #4 and Amazing Spider-Man #66-89 and Annual #5 respectively. When you buy volumes 3 and 4 make sure to check that they’re both edition 1 or both edition 2 so that you don’t miss out on any issues. Edition 2 volumes have the title Amazing Spider-Man on their front covers (along with different artwork) while Edition 1 volumes do not. Issues reprinted are also indicated on the front cover. Amazing Spider-Man Omnibus Vol. 1 contains Amazing Fantasy #15, Amazing Spider-Man #1-38, Annual #1-2 and the Spider-Man stories from Strange Tales Annual #2 and Fantastic Four Annual #1. All the issues are sequenced in the order they were originally published. Introductions from the original 1987 Marvel Masterworks volume appear at the beginning and every ten issues of Amazing Spider-Man. Extras include a full page copy of Steve Ditko’s original cover for Amazing Fantasy #15 as well as a few other unused Amazing Spider-Man covers. There is no release date as of now for volume 2. Stan Lee knew how to create memorable characters and Steve Ditko knew how to draw them. Most of these tales were self contained and covered both Peter Parker’s personal life and his exploits as Spider-Man with the latter, often interfering with the former in humorous yet believable ways. Peter’s social outcast status at school made him relatable and his adventures as Spidey entertained us with acrobatic fights and funny quips. The more contorted, flexible body positions that Spidey artists draw today may make Ditko’s Spidey look stiff by comparison, but the art still holds up pretty well. Even though the stories are dated and some dialogue super cheesy by today’s standards, they’re still a joy to read. Spider-Man had cool powers but often used his intellect to defeat his foes. There were certainly some lame villains whom would never be seen again, but the majority of them would be used by future writers for decades. I highly recommend these early stories, no matter the format, to new and old readers alike. Very nice piece, CE. I love Marvel's Omnibus line. So. Much. They're classy without being quite as unruly as the Absolute editions. And you would never see an Absolute Devil Dinosaur. I mean, "nice piece, Davie Chin." Although you might be CE. Who knows. "It's a mystery... ooh..."
Nope I'm just a reader and know very little about DC stuff which is why I come to this site. I was always a Marvel and particularly Spidey fan. So the identity of CE still remains a mystery. I already noticed two typos. I should probably have mentioned that ASM 1-500+ is also available as pdfs on DVD if you're the type who doesn't mind reading comics on a computer screen and doing the pan and scan. It's the best value out of all the options. This is a very useful guide, better than the dudes in my comic shop could come up with that's for sure. 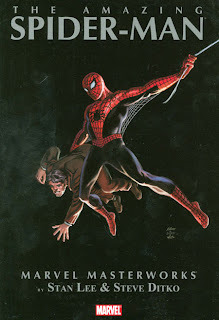 Amazing Spider-Man Omnibus Volume 2 is finally going to be released in April 2012. 'Tis way overdue.